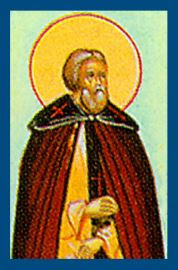 On the sixteenth of this month [March], we commemorate our Holy Father Aninas the Wonderworker. Unable though to conceal the grace of the miracle. Our Holy Father Aninas from a young age, without any education, loved gentleness and quietude, wherefore he lived in quiet seclusion. After the death of his parents, he withdrew at age fifteen into the desert near the Euphrates River. There he came upon an Elder named Maium, known for his extreme poverty, and settled there with him living a life of vigils and prayer. Living such an extreme life of poverty, they were only able to eat once every four days. They rejoiced and delighted to live in such a manner, considering their meager food as if it came from a royal table. Soon after his spiritual teacher and guide wanted to withdraw from that place. But the blessed Aninas said to him, "Forgive me, honorable father, but being led here by God to you, I wish not to withdraw from this place." Therefore the Saint remained there and did not withdraw. He would often go into the inner desert, at a distance of twenty to thirty days, and would return back to his cell. Having thus subjected the passions of his body to his nous, he received in return grace from God, so that even wild animals were subject to him. For this reason two lions would follow him wherever he went. This happened because one of the lions had a thorn stuck in his foot, and when the Saint took it out and bound his foot, he restored him to health. Hearing of this the fame of the Saint spread everywhere, causing a large crowd of men and women to seek him out, who carried with them many who were sick, and the Saint healed them by his prayers alone. Hence he ceased going into the inner desert, and remained in his cell. His drinking water was not near, but he had to walk five miles to the Euphrates River and carry it back. Because he alone would drink of it, he brought back only a little, but as crowds of people flocked to him, they were in need of water. Therefore he dug up a small pit, in order to gather the rain water, but it would quickly deplete due to the large crowd. One day he ordered his attendant to bring water from the pit, but he was informed that it did not even contain a cup of water. Thus the Saint raised his eyes to Heaven with a deep sigh in his heart, and said to his attendant with a glad countenance, "Go, child, in the name of the Lord, and draw from the pit, to bring water to the brethren." Having been persuaded the attendant went to the pit, and O the wonder! he found it full of water, and cried out, "Come all of you and see an extraordinary thing." Everyone jumped up and drank from the cool clear water, leaving them astonished, and they thanked God, who glorifies those who love Him. Wanting to deflate the fame and applause this miracle brought him, the Saint decided to once again start bringing water from the Euphrates as he did before. This left him with the indispensable work of bringing water to his cell every night. Once such a large crowd of people came to his cell, that all the water of the pit depleted. Taking up a vessel, the Saint went to the river, but before going a significant distance, he turned back. Those who were there thought he was returning due to an illness, so they ran to attend to the elder, and one of them taking the vessel from the hands of the elder, saw that it had been filled with water. With a loud voice he cried out, "Give glory to God, for the hands of the elder gushed forth living water." All ran to see the the vessel full of cool water, and were amazed. Then they fell at the feet of the Saint, entreating him to abandon such work, and not labor as much. It was said that if this miracle did not happen, the elder would have had to go all the way to the Euphrates River. So the Saint fell to the ground, and called himself a worm and an object of contempt to the people. When Bishop Patrick of Caesarea heard that the Saint was bringing the water by himself, he gave him a donkey to alleviate the labor. Once a poor man who owed money and was troubled by the man who gave him the loan, went to the Saint and told him about his misfortune. Because the Saint had no money to help him, and not wanting the leave the poor man without anything, he gave him the donkey, saying, "Child, sell the animal and liberate yourself by paying off your debt." When the Bishop heard about this, he gave him another donkey, saying, "I am not giving you this as a gift, but in order to bring back the water, and when I need it, I will take it back." Soon after another poor man came to him, and since the Saint had nothing to give him, he gave him the other donkey. When the Bishop learned of this, he had a large holder or container dug up, which survives till today. He would send men with animals to bring water and fill it up, and had the men return to him the animals. At that time there was a stylite in that area who was famous for his virtue, and because a certain brother was at enmity with him through a diabolical energy, he threw a stone at him and wounded him. Wanting to bring the disorderly man who struck him to justice in the courts, he came down from his pillar. The man of God Aninas came to find out about this through the foreknowledge granted to him by the Holy Spirit, so he wrote a letter to the stylite, which he sent by means of the lion. When the stylite saw the lion, he was struck with fear. The disciple of the stylite took the letter, gave it to his elder, and after reading it he became contrite, left the matter to God, and wrote back to the Saint and delivered it by means of the lion, thanking God and the Saint, as a healer of God. A certain woman had a grievous illness, for which she went to the Saint. Along the way a certain barbarian came upon her and tried to dishonor her, but the woman called upon the name of the Saint and his help, and immediately the wild barbarian became calm. Stretching out his hands to grab his belongings which he struck in the ground before he went to force himself on the woman, O the wonder! he found it planted in the earth. Amazed by this strange thing, he also went to the Saint, and after being catechized by him, he was baptized. He then became a monk near the Saint, and was called to the virtue of being a novice. When the woman received healing of her illness, she returned to her house rejoicing. The Saint did many other extraordinary miracles, which we have left out without wanting, that we may not appear to be tedious to the reader. Therefore the thrice-blessed man spent ninety-five years in his hermitage, without moving from that place. Thus all the years of his life number one hundred and ten. He foretold many predictions about the future, which came to pass. Having gathered around him a brotherhood, he called for them and chose one brother from among them, the most virtuous and discerning, and he told them, "Brothers, God has ordained him instead of me to be your shepherd." And indicating the brother with his hand, he embraced and blessed everyone. After seven days, he departed to the Lord.